Ohio's Graduated Driver License law mandates that a young driver receives a minimum of 24 hours of classroom instruction and 8 hours of behind-the-wheel instruction in driver training. Students may take the 24 hours of education through an online program, but must complete behind-the-wheel training at a traditional driving school. Students also must complete at least 50 hours of in-car practice (10 at night) with a parent or legal guardian. 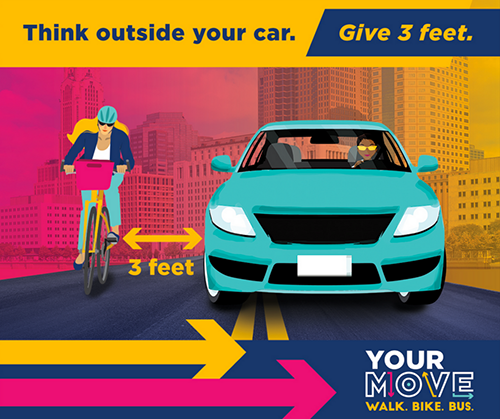 Your Move Ohio – Tips to be safe when you walk, bike, bus or drive. Did you know? Drivers are required to give bicyclists at least 3 feet of space when passing. Online driver education providers go through a process that includes a review of security measures, written content and curriculum, and actual student experience to ensure minimum standards are met. Once a program achieves an acceptable rating in all areas of the review process, it is licensed as an Online Driver Education Program in Ohio. Click HERE to search for an Ohio-approved online provider. The Juvenile Driver Improvement Program or Juvenile Remedial is a six-hour course required by courts and Ohio BMV for teens who have received a second or third traffic conviction. The course discusses reasons to modify unsafe driving behaviors and decisions teens make as novice drivers. Click HERE to search for an approved juvenile remedial provider. State law provides juvenile traffic offenders an opportunity to take a state-approved advanced juvenile driver improvement program (AJDIP) and petition the judge at the sentencing hearing with their AJDIP certificate. AJDIP training provides a hands-on approach to performing emergency maneuvers due to inclement weather and crash avoidance for those not-so-ideal traffic situations. Click HERE to search for an approved AJDIP provider. Driver training options for adult drivers include abbreviated adult, mature driver and commercial driver training. A 4-hour in-person class followed by 4 hours of behind-the-wheel training with a licensed instructor with a licensed abbreviated adult driver training school. A 4-hour state-approved online course followed by 4 hours of behind-the-wheel training with a licensed instructor affiliated with a licensed abbreviated adult driver training school. A 4-hour in-person class followed by 24 hours of driving with a licensed driver 21 years of age or older*. A 4-hour state-approved online course followed by 24 hours of driving with a licensed driver 21 years of age or older*. *Applicants who choose the option for 24 hours of driving with a licensed driver 21 years of age or older cannot complete more than four hours of driving in one day. In addition, applicants who choose this option are required to complete the Twenty-Four Hour Affidavit (BMV 5789). Click HERE to download Abbreviated Adult Program reference card. Click HERE to search for an approved abbreviated adult course provider. Mature driver courses are designed to update older drivers on new laws and practices in the ever-changing driving environment. Courses include classroom and driving sessions with a certified driving school. A certificate issued at the completion of the program will allow a driver, at least 60 years of age and older, to receive a discount on their insurance (rate of discount determined by the insurance company). Click HERE to search for an approved mature driver course provider. Commercial Driver License (CDL) programs train drivers interested in the commercial trucking industry. Programs for Class A vehicles consist of at least 80 hours combining classroom, range and road training. Programs for Class B vehicles consist of at least 40 hours combining classroom, range and road training. Click HERE to search for an approved CDL course provider.